It's time again, boys and girls, for Chuck Wendig's Flash Fiction! This time it was a little different. Seems he found an interesting word generator and decided to use it for this week's challenge. We had five random words to use in our story: Figure, Dusk, Flirt, Mobile Phone, and Wig. We can use them any way we want to, whether slang or actual definition, and we can use a form of the word, like cell phone for mobile phone. This one took me a little while to formulate, but I've posted the image that really kick-started the short story I wrote. It's much fluffier than my last one, so don't expect anything heavy. Still, I hope you enjoy it. Here's my entry for the Random Five Word Flash Fiction Challenge, in 1,000 words or less (it's actually 941). Caroline stared down at her cell phone and cursed. Ben had said he would be here, right in front of the brick wall with the vintage hand painted Coca-Cola advertisement. He was almost forty minutes late, and dusk was beginning to set in. How long was she supposed to wait for him? She heard a moan come from behind her and sighed. Either someone was getting lucky in the parking lot, or the zombie apocalypse had begun. In her current mood, she couldn’t decide which she’d prefer. She checked her cell again, saw another minute had passed, and tried not to be irritated. Ben was notoriously late, but his other qualities tended to balance that out. Sure, he would probably be late to his own funeral, but he was funny, smart, had amazing eyes, and even more amazing rear, liked Simon Pegg, and wasn’t put off by her affinity for vintage advertising art, like the Coke sign. But his tardiness did get old at times. Especially those times when she started to wig out because she was afraid something had happened to him. Like now. Because her imagination was way too vivid, it flirted with wild ideas like car accidents, muggings, holes opening up to swallow him down to the world of dinosaurs in the center of the earth. Caroline shook her head. She wasn’t going to think like that. It only made her feel like an idiot when he showed up, usually racing around a corner, mostly out of breath, full of apologies. She was about to call him when she heard a sharp whistle. A sharp whistle that sounded remarkably like Ben’s. Wrinkling her brow, she turned to look first right, then left, nearly looked behind before she remembered the moaning couple. The sound came again, as if floating down from the roof tops. But that wasn’t possible…unless…. She looked up, directly across the street, and saw a figure standing on top of the three story granite building. She craned her neck, squinted her eyes, and saw the outline of a familiar man. “What are you doing?” she called, completely baffled, slightly miffed, and very amused. She cocked an eyebrow and crossed her arms over her chest, but did as he’d asked. This, she decide, ought to be good. She heard the sound of material unraveling, and a split second later saw a giant image on canvas flutter down the wall where Ben had been standing. She immediately recognized the advertisement; it was a 1940’s magazine ad for Chesterfield Cigarettes, but it was slightly altered. Instead of the fresh face of the model, Caroline’s face had been drawn in. She was holding a cigarette case; the wording above read “ – and it’s Always Ben and Caroline for keeps”, with their names substituted for the simple “ABC” Chesterfield had used. 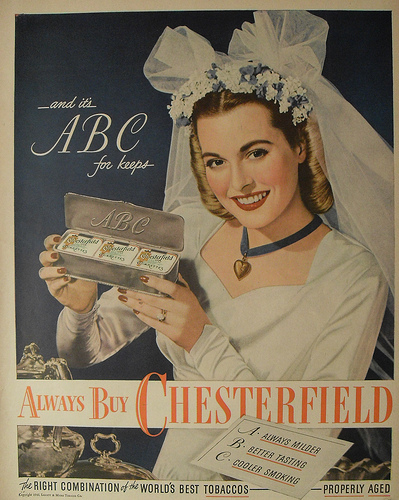 The cigarette case itself had the requisite “ABC” carved in the top, but the small cigarette packets were replaced with images of wedding bands peeking out of velvet boxes. The boldest part of the ad, the words printed brightly across the bottom, had her blinking, her mouth hanging open, closing, opening again. What should have said “Always Buy Chesterfields” had been replaced with “Marry Me Caroline”. The tilted card again read “Always Ben and Caroline”, completely ignoring what was originally printed there. And finally, the smaller script across the very bottom had been replaced by “The Right Combination of the World’s Best Love…Marry Me”. She put her hand to her throat, felt hysterical giggles and breath taking excitement mix. Her eyes filled with tears as she gasped for air. Behind her, the moaning couple finally emerged. The woman, a leggy redhead, paused to read the sign. She turned to the brutish man standing beside her and elbowed him in the gut. “Yeah, yeah.” But the redhead linked her arm through his and the couple strolled away, her stilettos clicking along the sidewalk as they went. By the time she was left alone, Caroline had managed to gulp in enough oxygen to keep from fainting. Then she saw Ben’s figure appear across the way, watched as he jogged to her, the purple light of dusk a halo around his dark blond hair. “Ben, when did you…how did you…” How was she supposed to form a sentence? Ben whooped and scooped her up, spinning her around as she threw her head back and laughed. He might be habitually late, she thought, but the man sure knew how to make up for it. Slightly frazzled writer mom with too much imagination and too little time.